Twittalert is a Twitter desktop app that lets you view recent tweets notifications directly on desktop. Once you will authorize this Twitter desktop app to your account, then you will be able to receive new tweets and can go to a particular tweet with your default browser. One of the main benefit of using this desktop app is that you don’t need to keep open your Twitter account to view new tweets. 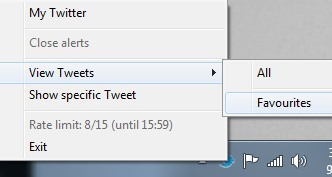 It will automatically show you notification on desktop, whenever a new tweet will come. Twittalert works similar like desktop clients for Twitter but doesn’t provide much options. It is simply designed to alert you for new tweets. But there is an option available to view all tweets or to mark tweets as favorite. 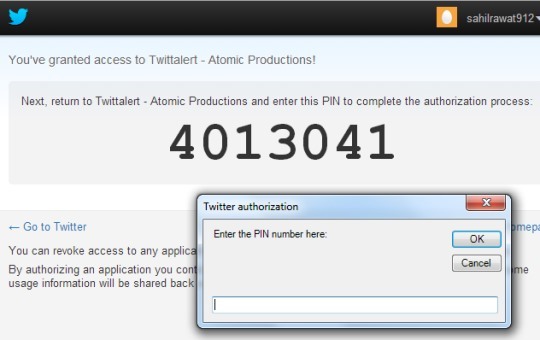 More in this, it provides facility to show a specific tweet by entering the ID of the tweet. 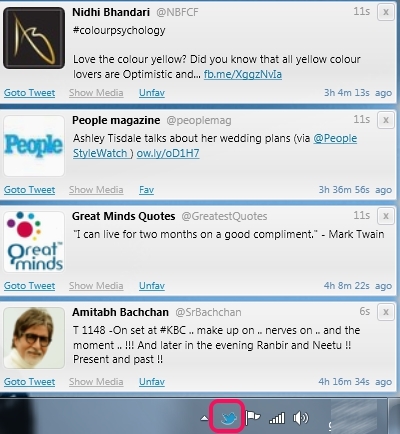 Above screenshot shows tray icon of Twittalert and all the recent tweets. How To Use This Twitter Desktop App? Immediately after providing the correct pin number, it will show you all the tweets on desktop, like it is visible in first screenshot. All visible tweets will disappear automatically one by one after 11 seconds. 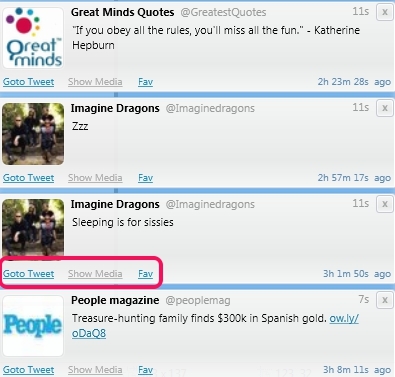 If you want, you can mark any tweet as favorite or can go to the tweet page by clicking on available option. You can view all the recent tweets directly on your desktop without opening a browser. It silently runs on system tray of PC and whenever a new tweet will occur, it shows notification. It’s a portable app so installation is not needed. Even more, it can be run using a flash drive. It provides facility to mark tweets as favorite so that you can access them later on by right-clicking on tray icon of Twittalert. Note: Although option is available to view favorite tweets. But it didn’t work in my case. It is quite lightweight Twitter desktop app. It comes in a zip file and is only 369 kb in size. Available completely free for everyone. For Facebook users, we have also reviewed 5 Facebook desktop clients. Twittalert is a nice Twitter desktop app and all available options work fine except to view favorite tweets. So you can try it to know whether it really works or not. Overall, you can give a try to Twittalert and can get recent tweets notifications directly on desktop.